Prepare to blast off on an edge-of-your-seat adventure with the Robinson family by checking out the full trailer for Netflix's upcoming drama series Lost in Space, released today, exactly 50 years after the classic sci-fi series signed off the air. There's plenty of excitement and thrills, and a cool new poster to go along with it all. This looks like another binge worth addition to the growing Netflix library. Lost in Space is a Netflix Original dramatic and modern reimagining of the classic 1960's science fiction series. Set 30 years in the future, colonization in space is now a reality, and the Robinson family is among those tested and selected to make a new life for themselves in a better world. But when the new colonists find themselves abruptly torn off course en route to their new home they must forge new alliances and work together to survive in a dangerous alien environment, lightyears from their original destination. A Netflix Original, Lost in Space stars Toby Stephens (Black Sails, Die Another Day) as John Robinson, and Molly Parker (House of Cards, Deadwood) as Maureen Robinson, the family's parental leaders who are struggling with their estranged relationship in the midst of trying to keep their family safe. As the Robinson kids, Taylor Russell (Falling Skies) is the strong-willed and confident Judy, Mina Dunwell (Maggie's Plan, Freeheld) is the quick-witted and definitive middle-child Penny, and Max Jenkins (Sense8, Betrayal) is the curious and sensitive Will Robinson, the youngest and most vulnerable of the clan, who forms an unlikely and inexplicable bond with a sentient robotic alien being. The Netflix Original series is produced by Legendary Television and written by Matt Sazama and Burk Sharpless (Dracula Untold, Last Witch Hunter). Zack Estrin (Prison Break) serves as showrunner. The three are executive producers alongside Synthesis Entertainment's Kevin Burns and Jon Jashni with Applebox's Neil Marshall and Marc Helwig. The original Lost in Space series was created by Irwin Allen. 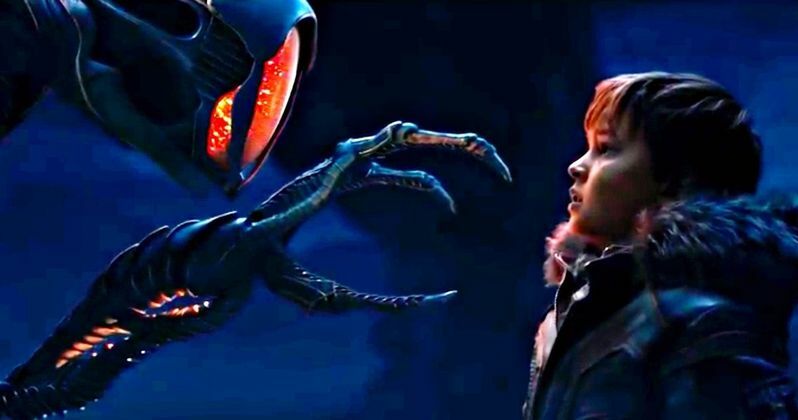 You can check out the first full trailer direct from https://www.youtube.com/watch?v=fzmM0AB60QQ|Netflix, along with the official one-sheet poster which shows the cool new robot at the heart of this thriller, which isn't quote as a goofy as the big screen remake that arrived in theaters in the 90s. Is it time for a new Lost in Space? From the looks of this trailer, that's a definite yes.